Giuli lives and breathes real estate and has a particular passion for interior design and style. On those very rare occasions when Giuli is not actively working to secure the best outcome for her clients, she can be found poring over home magazines, researching the latest in design, and imagining ways she can add warmth and beauty to living spaces. With this level of passion and visual creativity, Giuli has developed a reputation for her preparation and styling that significantly improves property appeal and potential profit. When it comes to selling, Giuli knows that first impressions strongly influence buyers: “When people are buying a home, it’s all about feelings and whether they can envisage themselves living there.” Bringing the whole package together to create a truly desirable home is a well-honed skill and one that Giuli uses to great effect for her clients. Giuli is caring and respectful and has a deep sense of loyalty to her clients. She recognises that selling the family home is a time of great change that can bring about feelings of uncertainty and stress. For this reason, the magnitude of being entrusted with a set of keys to a client's property is a responsibility that Giuli takes very seriously. She treats each home as if it were her own, takes great pride in giving time and attention to every little detail, and does everything within her power to deliver the very best possible outcome. One of Giuli’s many professional strengths is her unparalleled knowledge of the local area. 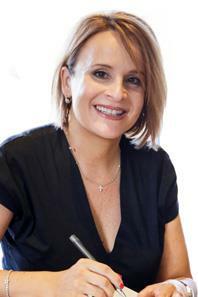 Giuli grew up in South Perth, went to school in Como, and purchased her first property in Como over twenty years ago. Since that time, Giuli has remained strongly connected to the local community and knows first-hand the value, amenities and lifestyle benefits that a life south of the river offers residents. Giuli is a longstanding and highly respected member of the Jones Ballard Team. She is a trusted colleague and an inspirational mentor whose commitment, drive, and passion run deep. After well over a decade of helping others realise their real estate dreams, Giuli continues to gain enormous pleasure from her daily experiences in real estate. "It gives me great joy to help others move into the next chapter of their life; to exceed a client's expectations; or see a buyer’s excitement when they find their dream home."